Enter These Sweepstakes and Your Next Disney Vacation Could Be Free! Sweepstakes to win Disney cruises, free trips to Disneyland, toys & more. 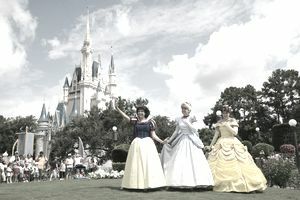 ••• Image © Disney / Jimmy DeFlippo, photographer. Used with permission. The Disney Sweepstakes List is full of current sweepstakes to win free Disney vacations, sweepstakes offered by the Disney company, and more. Disney sweepstakes give you and your family the chance to win a trip to Disney World or Disneyland, a free Disney cruise, or other great prizes without paying a cent. Disney sweepstakes often include Park Hopper tickets, free stays at the Disney Resorts, and special events like VIP tours of the Disney parks, breakfast with Disney Princesses, stays in the Cinderella Suite, and meet and greet events with prominent Disney stars. Enter to win a trip for eight people to Disney World worth over $22,000. Enter to win a free family vacation in Orlando, Florida. If you'd like to win other vacation prizes as well as Disney sweepstakes, visit the Top Vacation Sweepstakes List for all of our best sweepstakes and contests with dream vacation prizes.